Gard Dean Blodgett, formerly of Concord and Amherst, NH, passed away on March 13, 2019 after a brief illness. He was the devoted husband to the late Sarah Blodgett. Born in Concord, NH, he was the beloved son of the late Phillip and Irene Blodgett. After graduating from Concord High School in 1943 Gard immediately enlisted in the Army and was deployed to Europe. While assigned to 69th Infantry Division Gard fought in the Battle of the Bulge where he received the Bronze Star together with the Purple Heart. He returned after the war to New Hampshire to attend Dartmouth College, earning a degree in Geology. 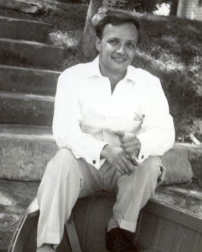 After graduation, Gard lived and worked in Washington, DC for most of the 1950s. While working for the Department of the Interior, he was part of the first detailed survey of Antarctica. His sketch map was the first to reveal a major geographical feature of the continent. In recognition, a small part of the Antarctica coast is named after him - the Blodgett Iceberg Tongue. In the late 1960s, he met the love of his life, the late Sarah (Beth) Weed of Evanston, IL. The newly married couple settled in Amherst, NH to start their family. Gard spent the balance of his career working for the US Army Corps of Engineers working in water resource management across New England. Throughout his life, Gard was an avid outdoorsman. Skiing was his favorite sport. He was particularly proud of having successfully skied down Tuckerman’s Ravine. He enjoyed hiking and watching sunsets with his beloved Beth at the top of Mount Monadnock. Most evenings and weekends Gard could be found working on his garden or doing a project outside. Later in life, Gard took up photography and helped call attention to the plight of retired greyhound race dogs. Gard is survived his son, Dean (Scott), his wife, Renee, and two grandchildren, Robert and Riley. He will be laid to rest at Blossom Hill Cemetery in Concord later in the spring.